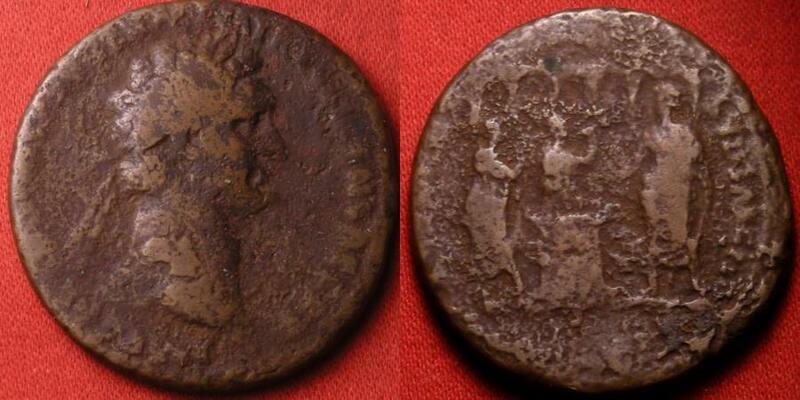 DOMITIAN AE as. LUD SAEC FEC, Secular games type, Domitian sacrificing over altar, flute player & harpist attending, temple of Jupiter behind. Rare. DOMITIAN AE as. Struck at Rome, 88 AD. IMP CAES DOMIT AVG GERM P M TR P VIII CENS PERP P, laureate head right. Reverse- COS XIIII LVD SAEC FEC, Domitian standing left, holding patera over lighted and garlanded altar; tibiae player and citharist (flute player & harpist) standing behind altar; hexastyle temple of Jupiter behind. RIC II 623, Rare. 28mm, 10.0g. 88 AD marked the 800th anniversary of the foundation of the city; tradition called for great games to be celebrated - games were offered to the public and splendid sacrifices to the pantheon were held. DOMITIAN AE dupondius. 86 AD. Fortuna standing, holding rudder & cornucopia. Left facing portrait with drapery. Very rare. DOMITIAN, as Caesar under Vespasian, AE as. Spes advancing, 72 AD.